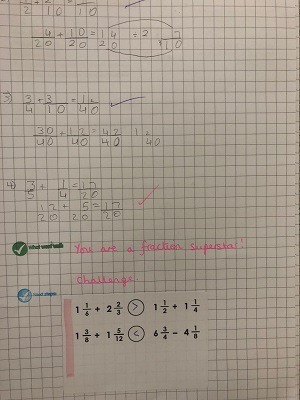 Mrs Smith also helps us with our learning. 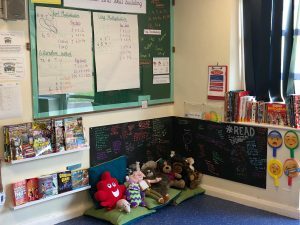 Welcome to our year 6 class page! 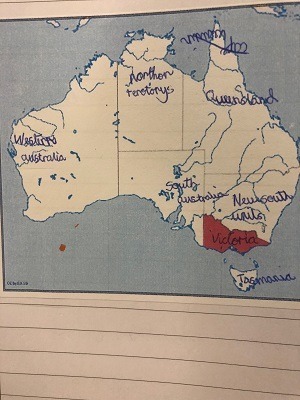 This is where you can see all our amazing learning. 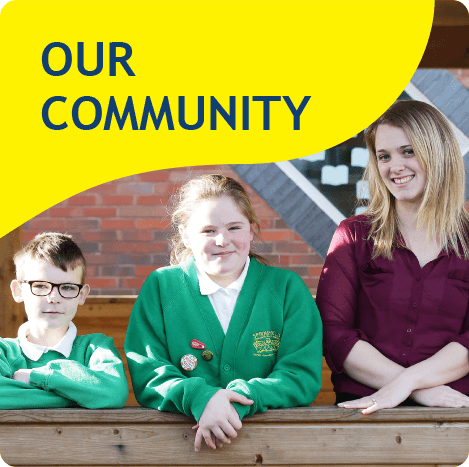 This year is incredibly important and exciting and all of us are ready for our final challenge at Springfield Primary. 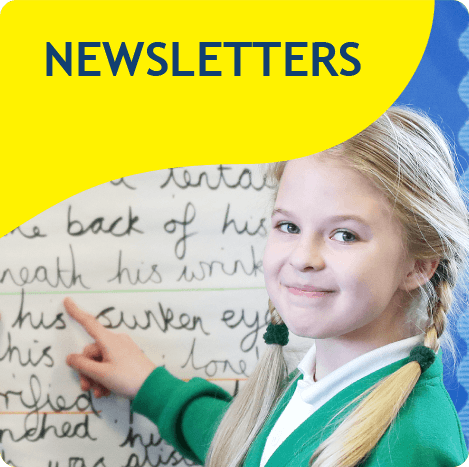 We hope you enjoy browsing through our learning throughout the year. 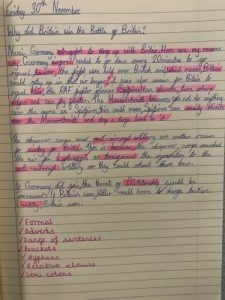 This half term we have started to get stuck into our enquiry which is ‘Why did Britain once rule the largest empire the world has ever seen?’ We have learnt about the different countries that were part of the empire, how different countries became more multicultural and learnt about where Britain got a lot of its materials, such as silk and tea. We then learnt about the slave trade between Europe, Africa and America. 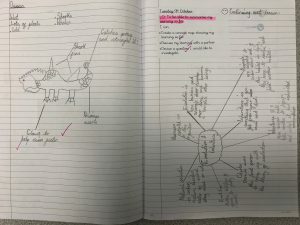 From reading information texts and watching clips from ‘Roots’ the children wrote an emotive diary from the perspective of a slave in the 18th century. 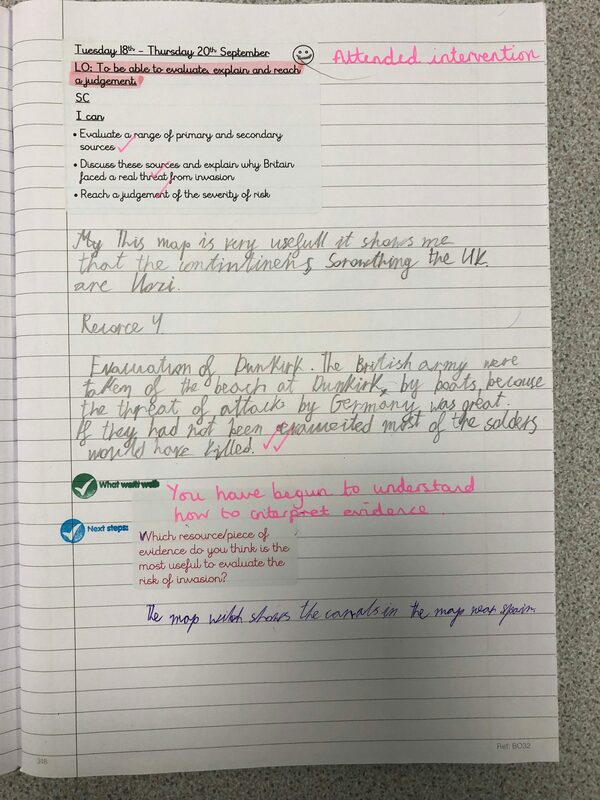 Following on from this, we learnt about life in Britain at the peak of the empire. 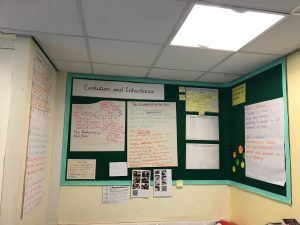 We read and analysed extracts from Water Babies, Oliver Twist and Street Child and used this and other non-fiction texts to explore what life was like for a child in Victorian Britain. 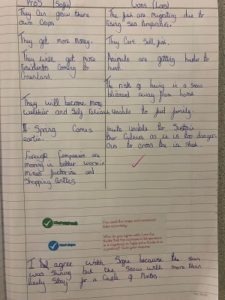 The children wrote a report on this, using lots of their newly refined Grammar skills. In Science, the children have been learning about the human body, particularly the respiratory system. 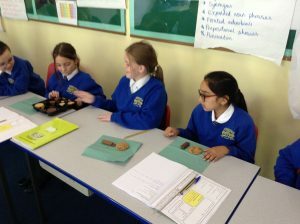 They have also learnt about how drugs and different foods affect the body. The children wrote a balanced argument with the question ‘Should all foods with a high sugar content be banned in the UK?’ They put forward arguments regarding the NHS, obesity, diabetes, freedom of choice and employment. 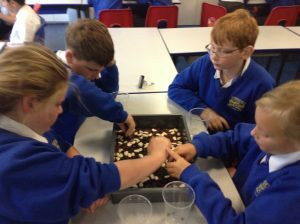 In Geography we are learning all about the river. 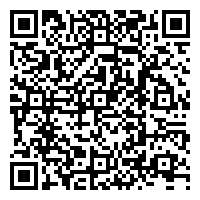 This links with the ‘Trout in Classroom’ project that we are currently taking part in. Our 100 trout eggs finally hatched early February and they are starting to move around more. 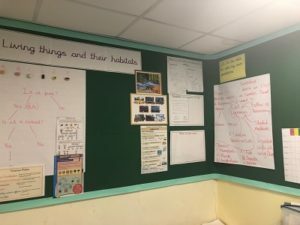 Neil has visited us on many occasions to talk about the fish and what type of habitat they need. The children then sequenced a river, labelling the features and talking about how it might change from source to mouth. They have also sketched OS maps and read these, picking on key features of the area they have sketched. The children have taken part in a very exciting project which is leading to an exhibition, here at school. 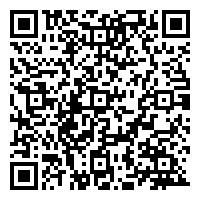 We don’t want to reveal too much, but the theme was Street Art. 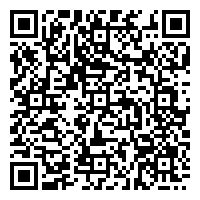 Watch this space for an update and photographs! The children have become familiar with Purple Mash and have started to explore apps, particularly linked to programming. 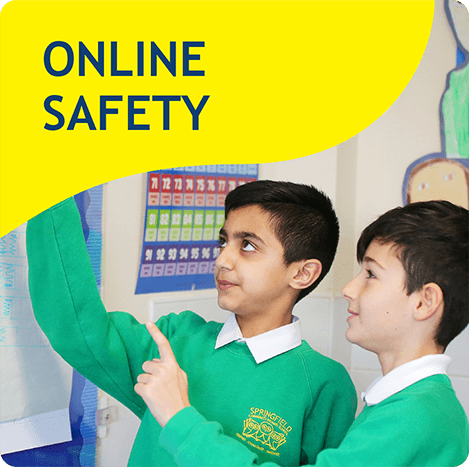 As part of online safety, we discussed the rise of social media and the children have created a display, warning others about potential dangers online and how to keep safe. 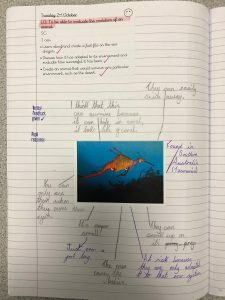 The children have continued to revise key concepts and have started to apply these skills to reasoning and problem-solving questions. 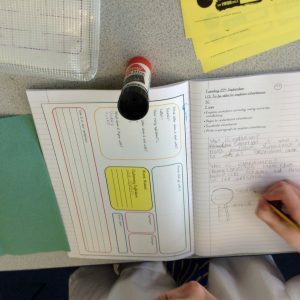 They have also thoroughly enjoyed TT Rockstar’s to improve their times table knowledge. 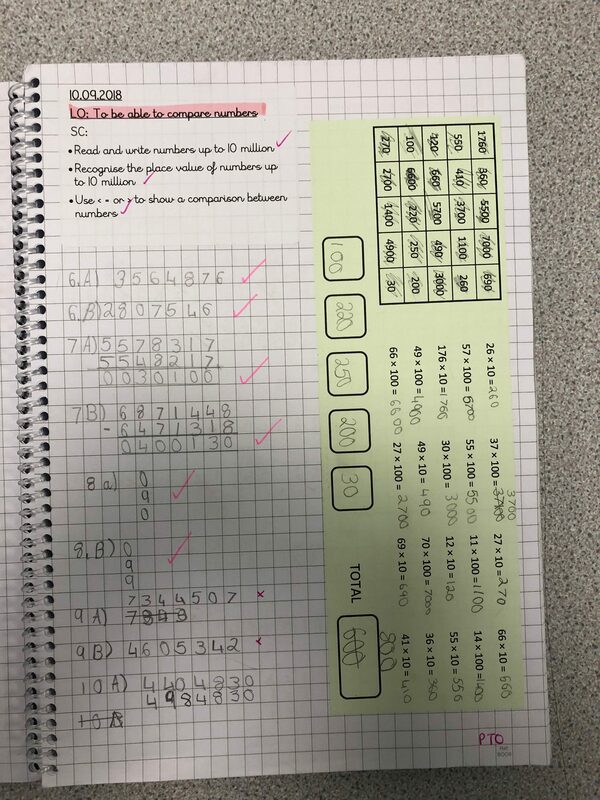 We have continued to develop our basic arithmetic skills and apply our number knowledge. 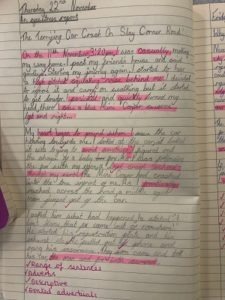 The children have worked incredibly hard to maximise their learning with ALL pupils making progress in their mock SATs, some by 15+ marks! That is amazing! After Christmas, we will start to use these skills for Reasoning and Problem Solving. 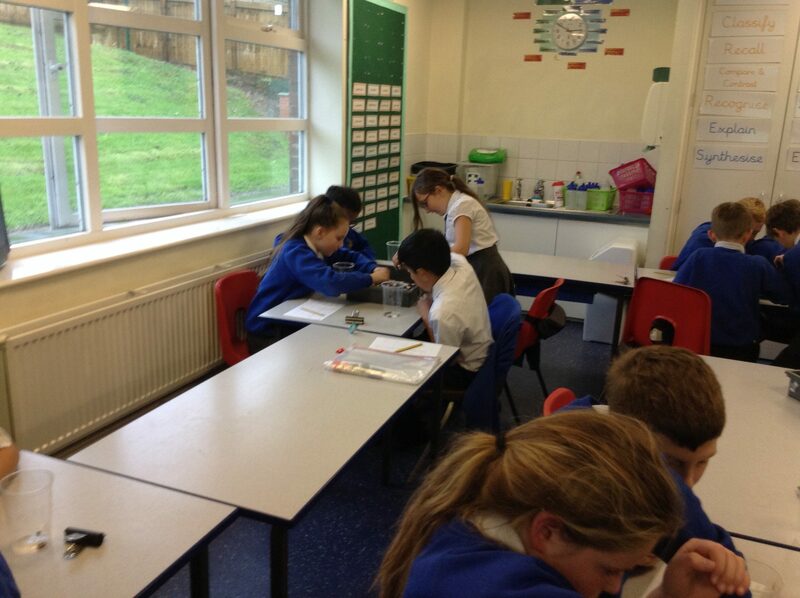 We will continue with Arithmetic sessions to further embed the skills the children have now learnt. 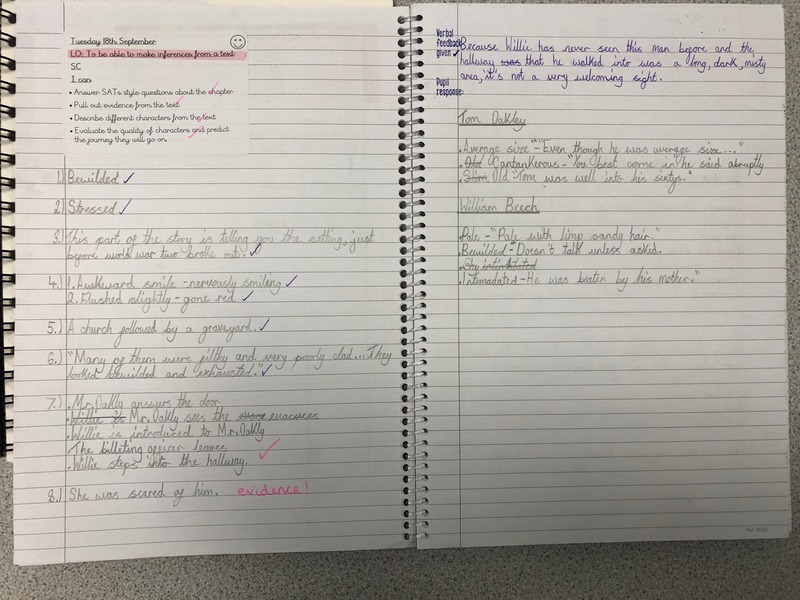 We have begun to use Reciprocal Reading a lot more in our lessons. 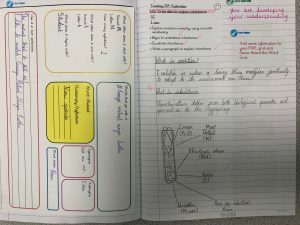 This involves the children leading their own discussions about a text. They then use all the learning to answer some inference questions. 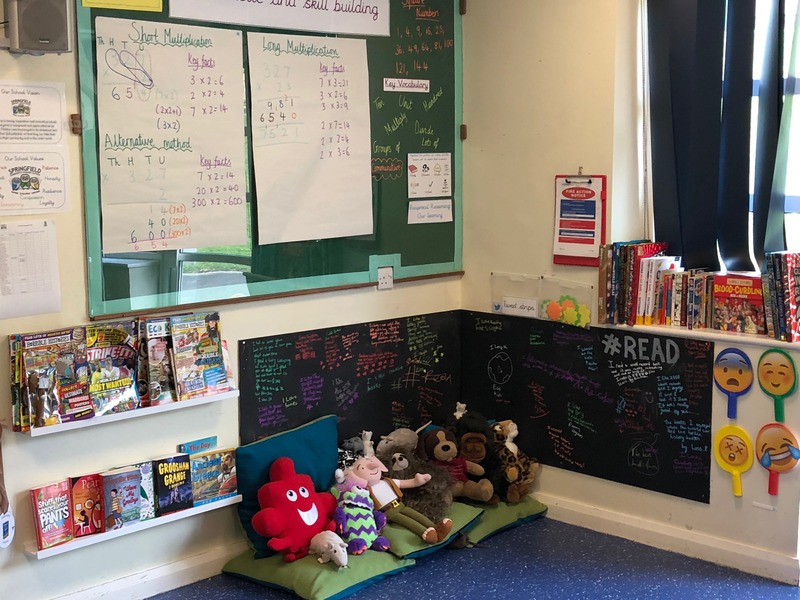 The children have continued to impress on their STAR readers with most children increasing their reading age through daily reading and discussion, some by a year! 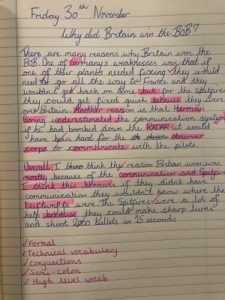 This term we have really focussed on embedding writing skills and getting the basics consistently right, particularly spelling and grammar. 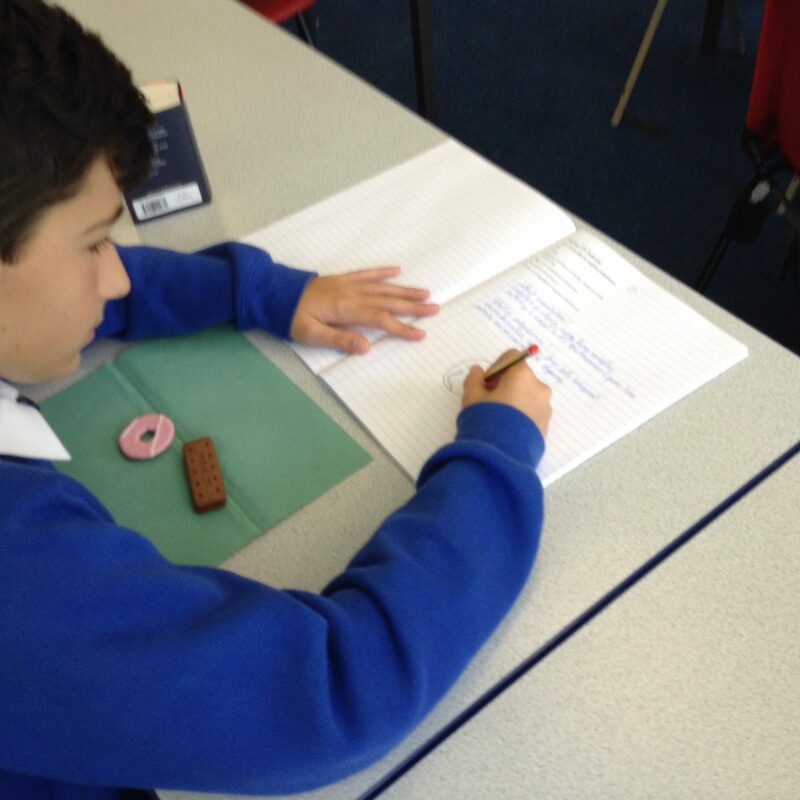 We have completed mini writing workshops with a different focus each week. 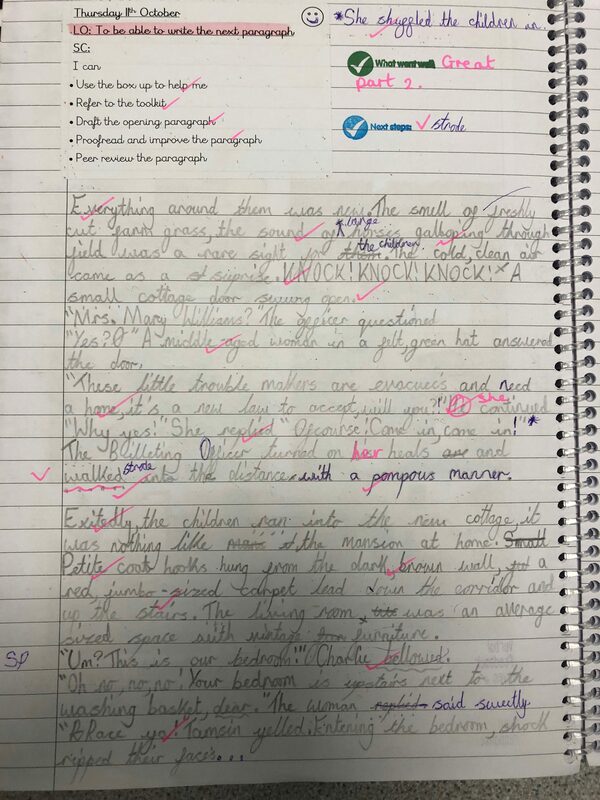 Our favourite was the eyewitness account of Red Riding Hood from Revolting Rhymes. 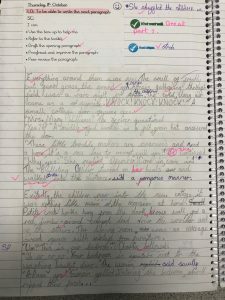 We have also written our first piece for History. 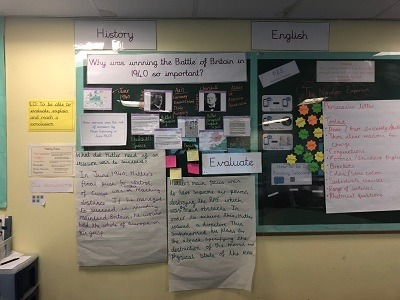 The children analysed lots of sources of historical information, discussed it and then produced an answer to the question ‘Why did Britain win the Battle of Britain?’ Have a look at the photographs to see some of their impressive responses! 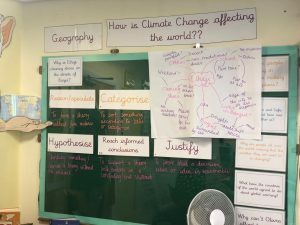 We are covering a huge topic in our first Geography enquiry ‘How is Climate Change affecting people around the world?’ We have studied data, watched pictures, read maps and all sorts of other things around this topic. 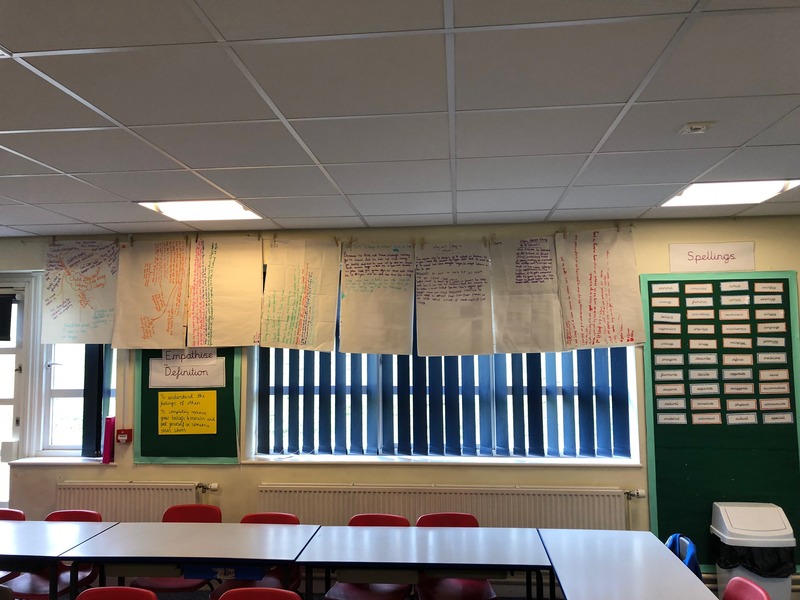 We have held debates and created an information poster that shows how Climate Change is affecting different parts of the world. After watching the Iceland advert about palm oil, we wrote a persuasive letter to Michael Gove (Minister for Environment) to encourage a change to ensure that palm oil is used sustainably to reduce the amount of deforestation in the Amazon. 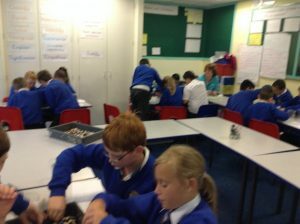 In Science we have learnt all about Living things and their habitats. 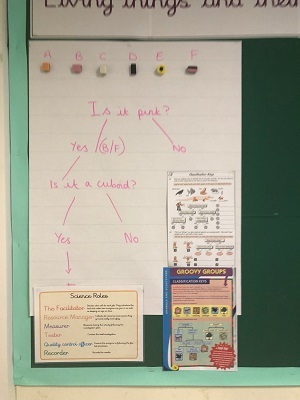 We used liquorice all sorts to create a classification tree to understand the process used to classify living things. 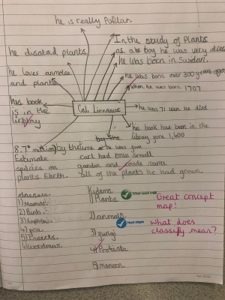 We studied the work of Carl Linnaeus and created a concept map of his work. We then moved on to creating a table to classify animals into their classis, such as mammals or amphibians. We are very excited to start our Trout in the Classroom project next half term. 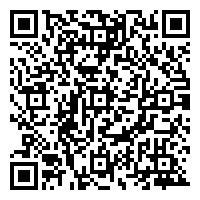 We will be raising our own trout that will be released into the River Calder in Towneley Park. 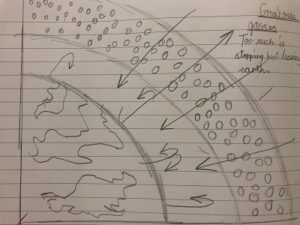 We have continued our art study of L.S. 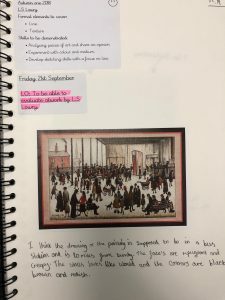 Lowry and have developed lots of skills with different mediums including oil pastels and acrylic paint. 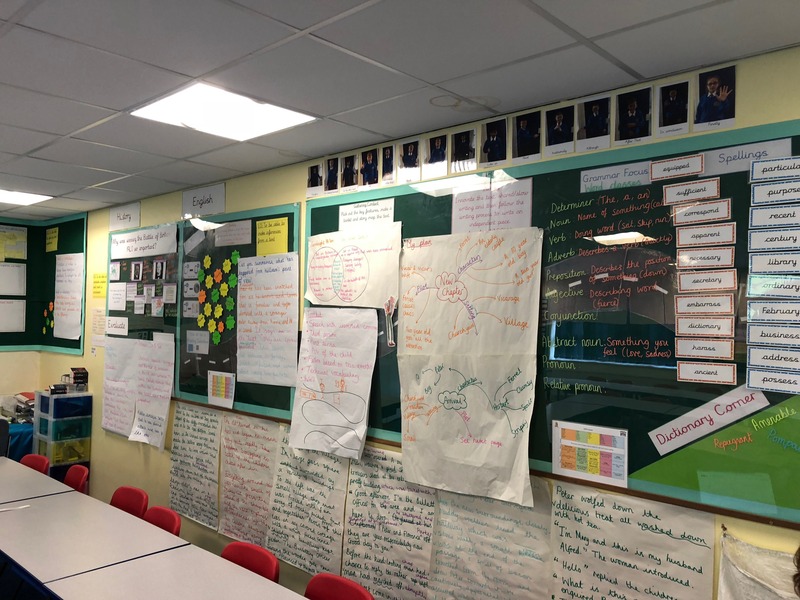 We have produced a final piece on artist canvas that is on display outside our classroom. 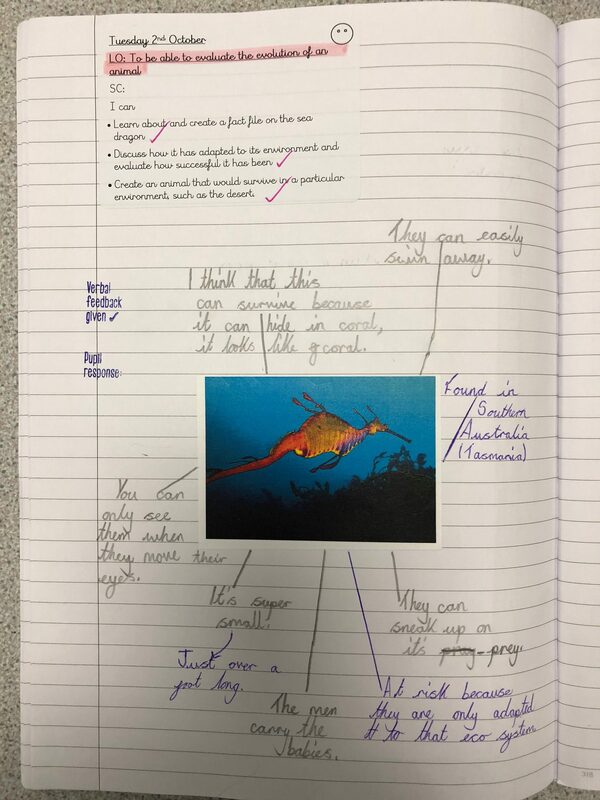 We have then evaluated our artwork to know how to improve next time. 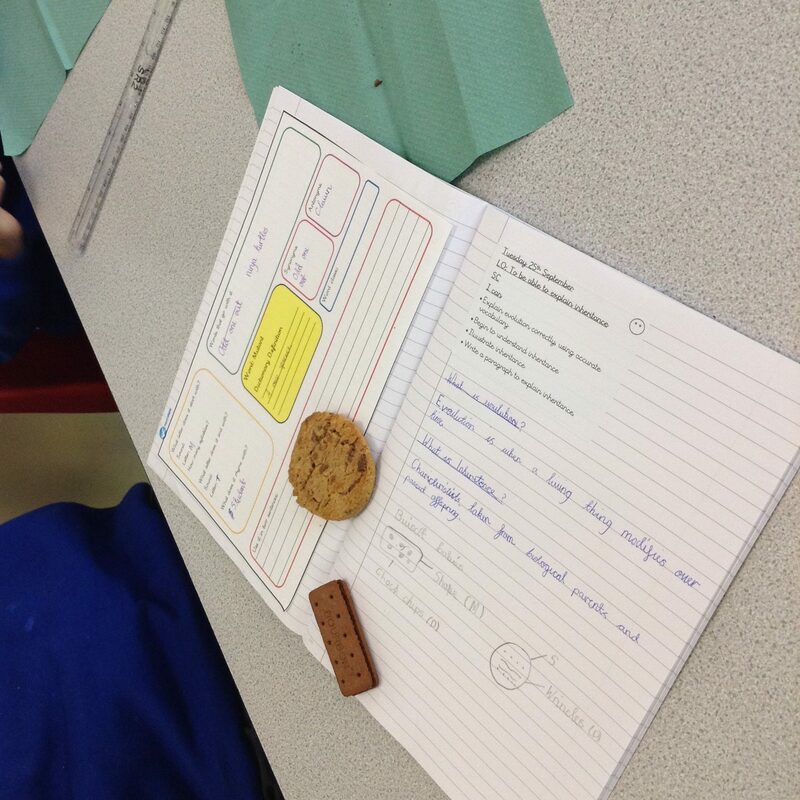 In preparation for the Christmas Fair, we have researched, planned and are ready to create the perfect festive treat! 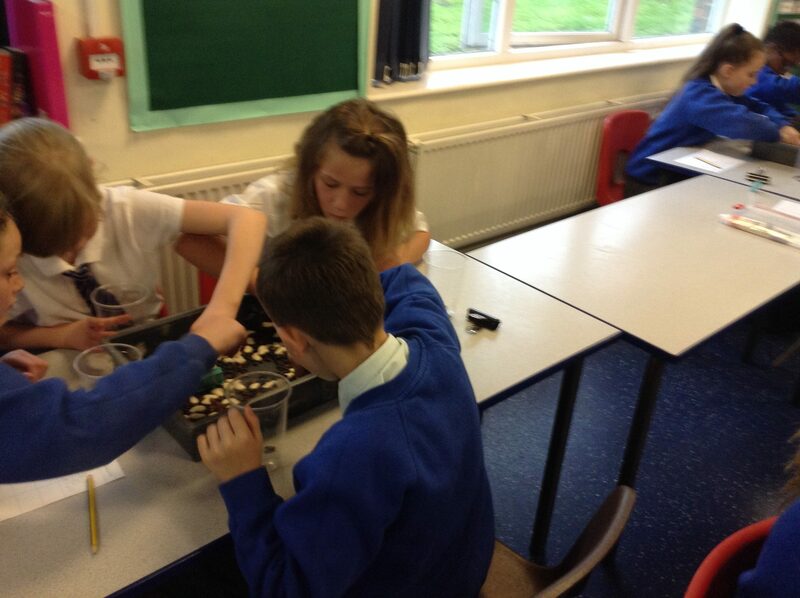 We are making a variety of traybakes that can be sold at the fair. This includes a vegan option! The pupils have chosen recipes, discussed what they think will sell the best and designed packaging. Keep an eye on Twitter to see our table! 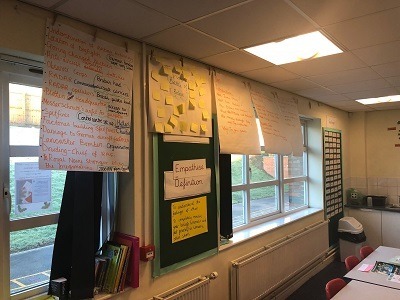 Year 6 have spoken about differences this half term and celebrated the different qualities that they bring to their family, friendship groups and class. They have struggled to identify some qualities in themselves and therefore they have spoken about each other. We discussed how nobody is ‘normal’ and why there is no such thing as ‘normal’ when we discuss people. 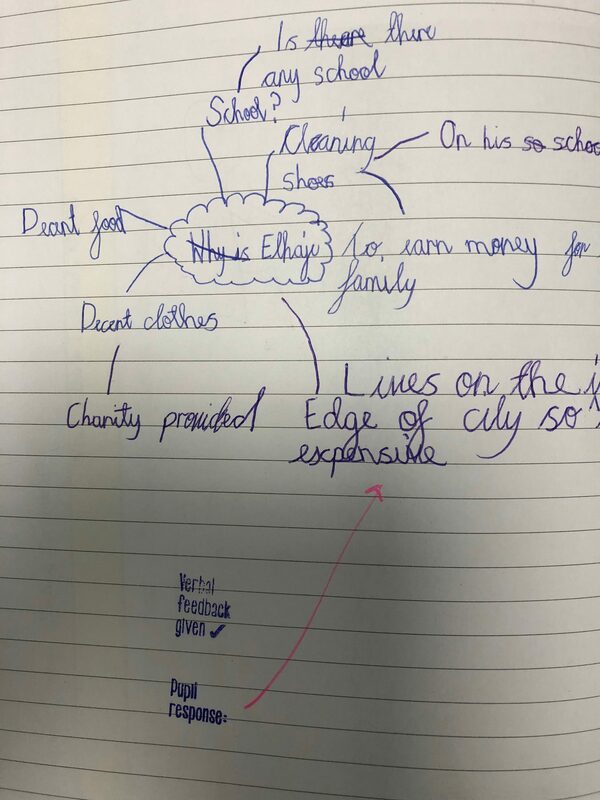 We talked about different families, lifestyle choices and cultures. What a mega busy half term! 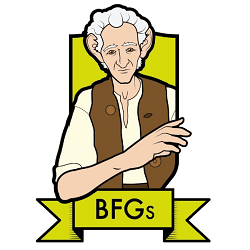 The pupils in The BFG’s have really impressed this half term. 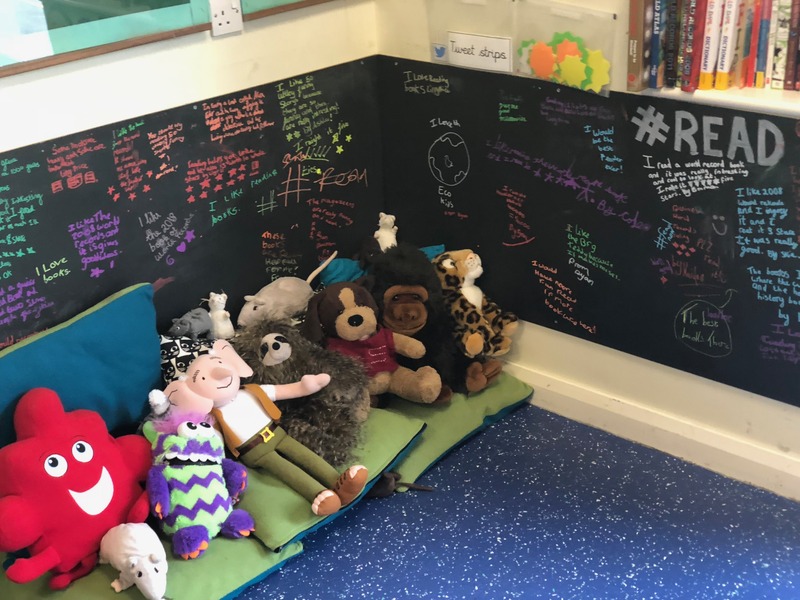 The way they are behaving is exemplary, they are becoming fantastic role models for other children around school and their enthusiasm to learn is brilliant! 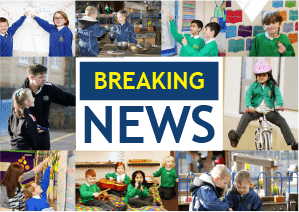 Well done on a spectacular start to the year! 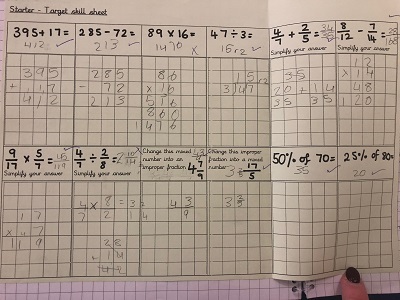 We have had a big push on basic skills and arithmetic this half term and this will continue until Christmas. 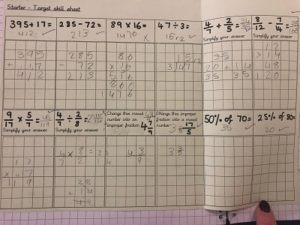 The children have developed their addition, subtraction and multiplication skills as well as their place value knowledge. 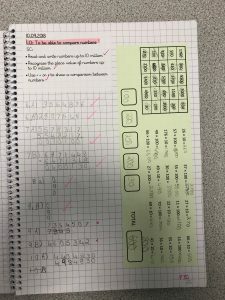 In the final week we are having a big focus on Times Tables by singing lots of songs and using Times Tables Rockstars as well as other interactive games, such as Hit the Button. 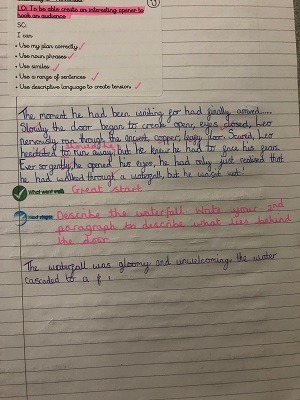 This half term we have been using past SATs papers to develop our Reading Detective skills. 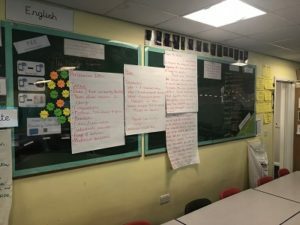 This is in preparation for developing Reciprocal Reading in class, which will lead to group discussions around different texts. 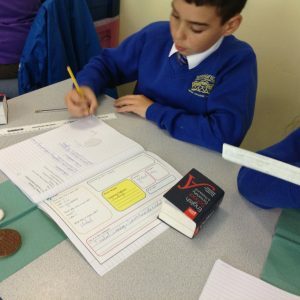 The children are enjoying our class novel which is Stories from Shakespeare. 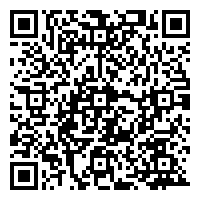 Just a reminder for adults at home, reading everyday is key to develop confidence with reading! 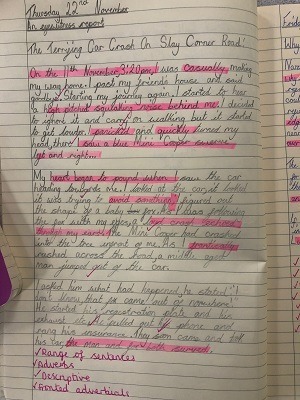 Writing in year 6 is always a big learning curve! 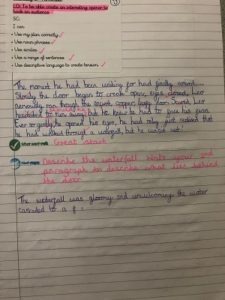 The pupils are just getting into the swing of writing independently and making use of peer reviewing as well as the importance of proofreading. 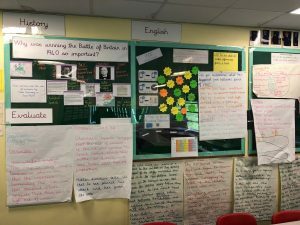 Our writing has linked to WW2, including a link to our key texts which were ‘Goodnight, Mr Tom and The Silver Sword.’ The children have analysed the texts and picked out the key features, linked to grammar and punctuation. 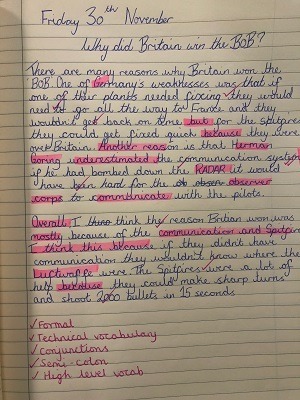 They have then begun to write a chapter based around a child’s point of view of WW2 from either Britain or Poland. 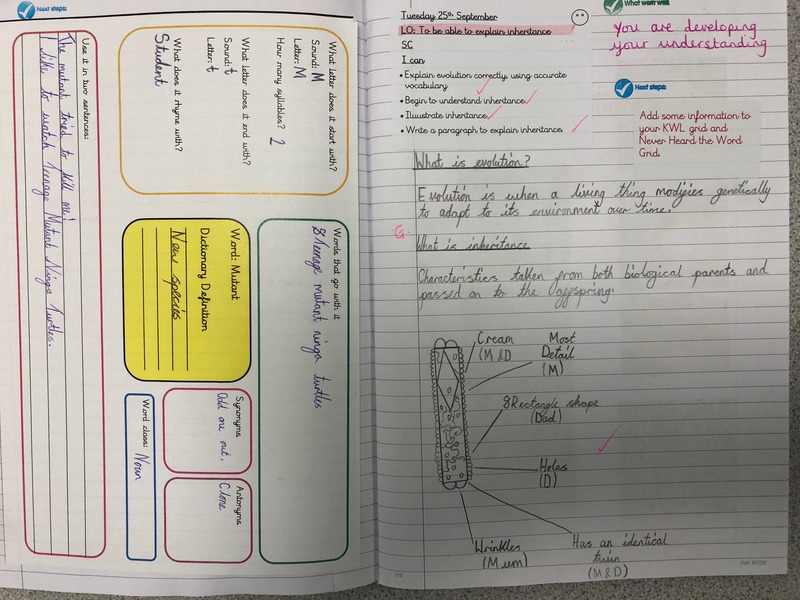 They have also written individual pieces independently, including a descriptive piece, an action scene and a diary entry as well as a science piece – find out about that in the Science section! 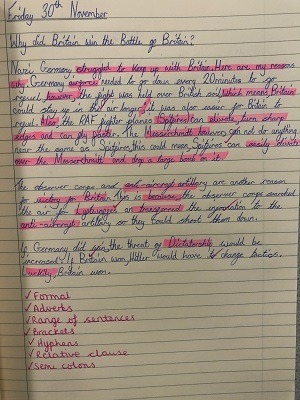 In History we are studying ‘Why was winning the Battle of Britain in June 1940 so important? 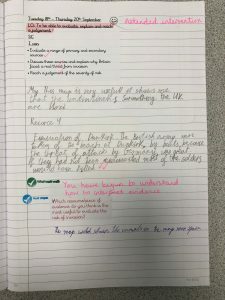 We have looked at a map of Europe and discussed the power that Hitler had behind him, we also listened to a speech made by Churchill talking about preparations that had to be made as well as reading the front cover of The New York Post from the time – it revealed lots of information about the events surrounding the Battle of Britain. 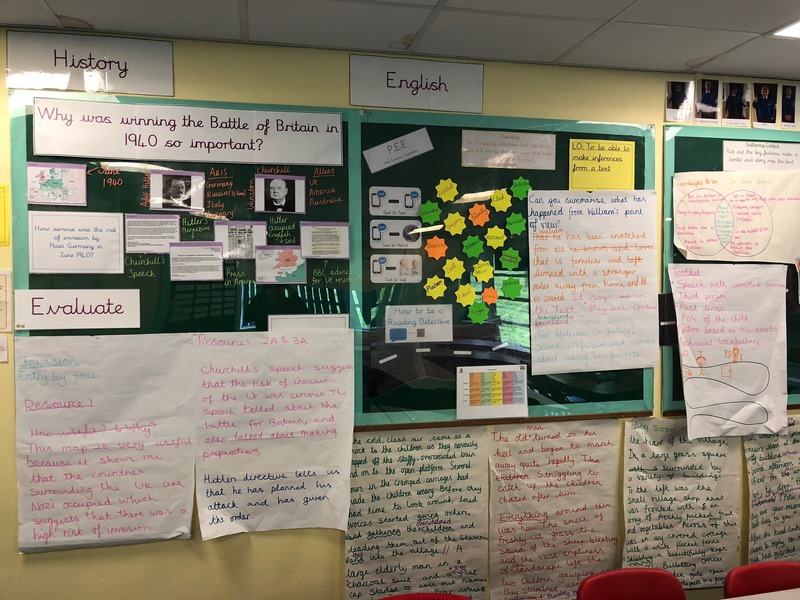 We will continue to learn about this next half term. 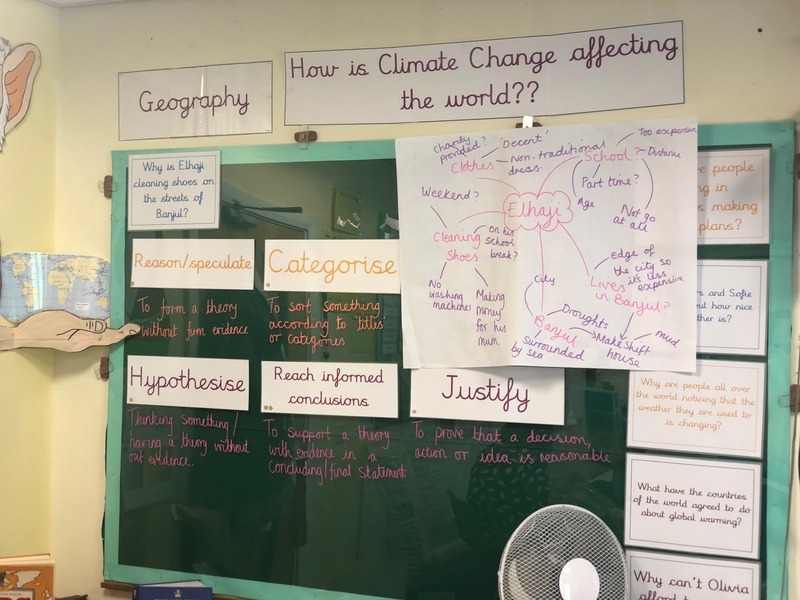 We are covering a huge topic in our first Geography enquiry ‘How is Climate Change affecting people around the world?’ We have linked this to our science learning as well. 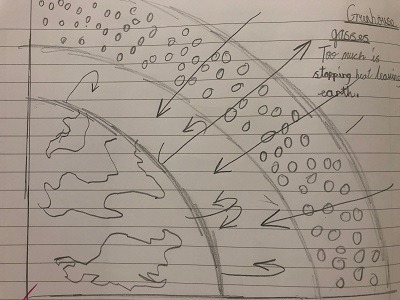 We have started to look at the effect of Climate Change on Africa, The Gambia. We have discussed what Climate Change is and what it means in the long term, we have also listened to latest news regarding Climate Change and what the current situation is. 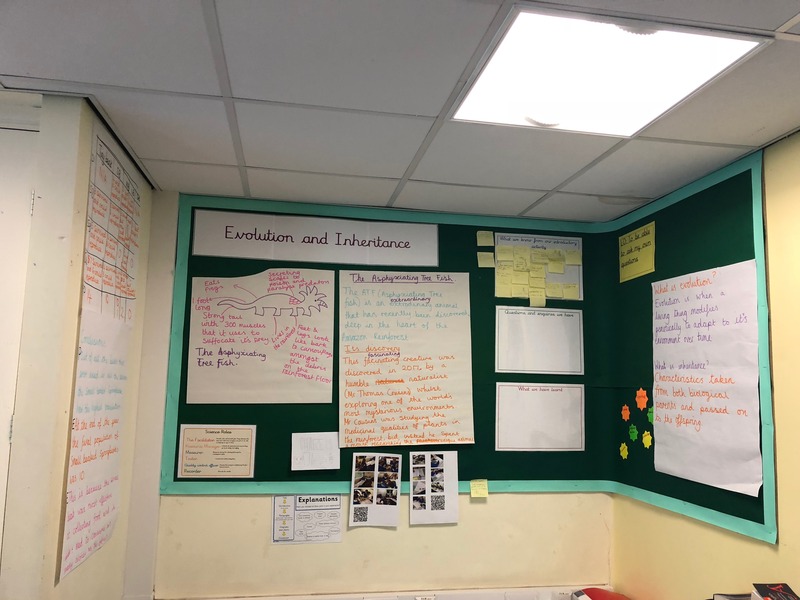 In Science we have learnt all about Evolution and Inheritance. 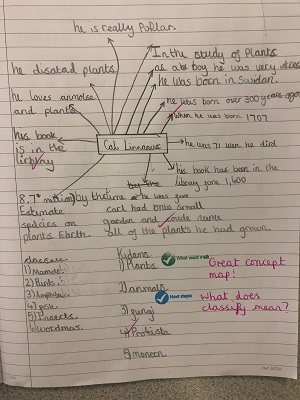 We have asked our own questions, held discussions, learnt about The Theory of Evolution and Charles Darwin. We also turned into a species of bird that lived on ‘Clippy Island’ this allowed us to investigate the theory of natural selection. 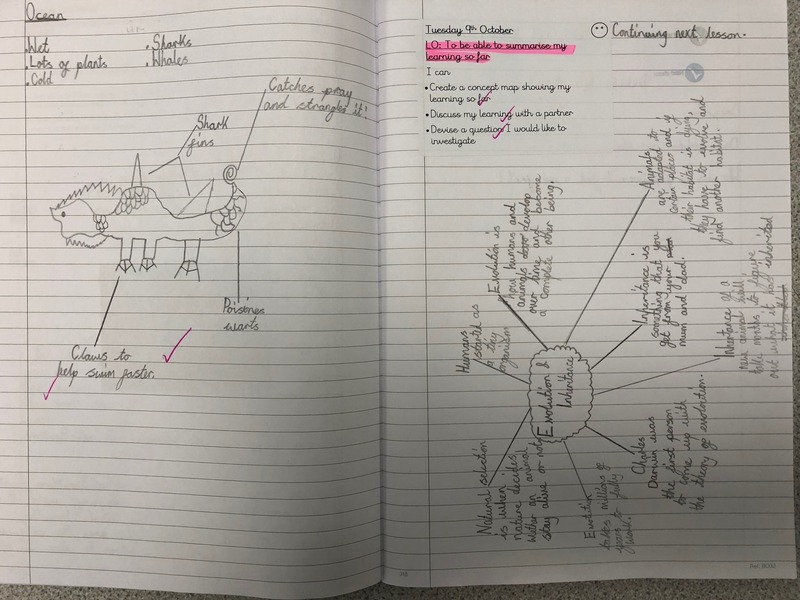 We also created creatures for environments, discussing how adaption and natural selection had created the perfect animal for the environment. 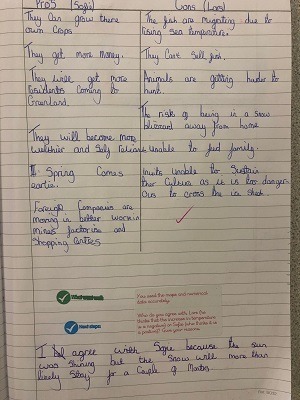 To link to Geography, we looked at why these creatures might be at risk and that this is out of their control mainly focussing on Climate Change. One of our challenges as part of this was to talk about how the animal may evolve to adapt to the ever-changing world. 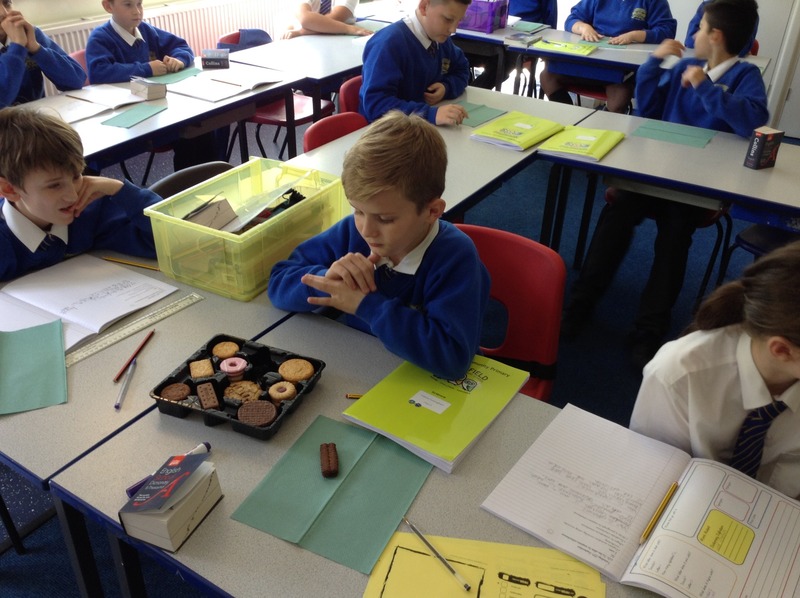 When learning about inheritance, we created biscuit babies. Choosing a ‘mummy’ biscuit and a ‘daddy’ biscuit from a selection pack, the children had to draw the offspring that the biscuits would create. For example, taking a bourbon and a cookie as the parents, the baby could be a cookie with cream in the centre. 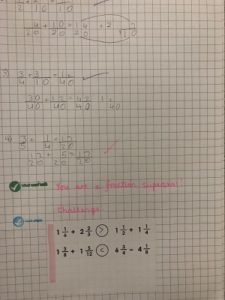 Watch the video below to hear some of the children’s examples! 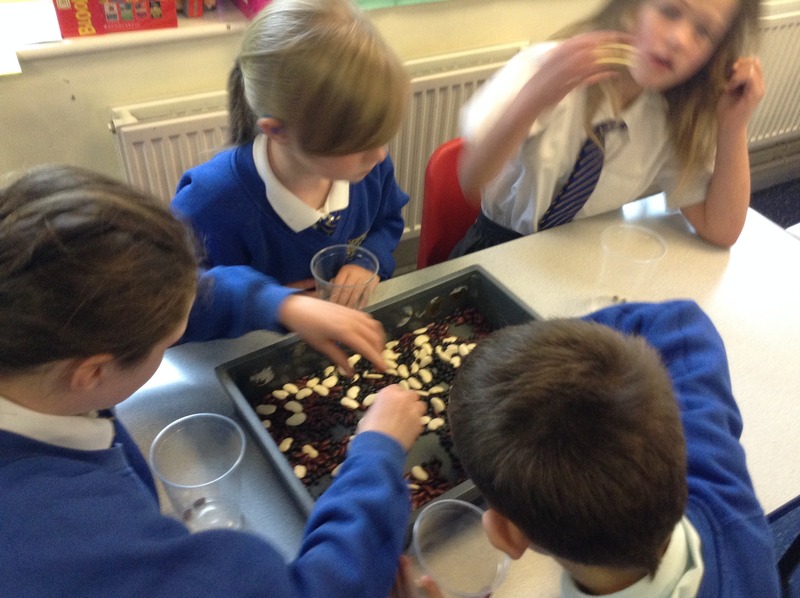 We are only just starting to get our teeth into our Artist Study of L.S Lowry. 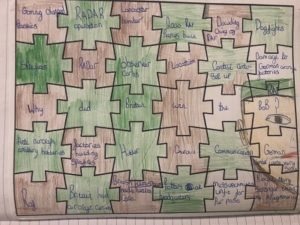 We have looked at pieces from the time of WW2 and discussed at length our opinions, but also the techniques that the artist has used to create texture and depth to the art. 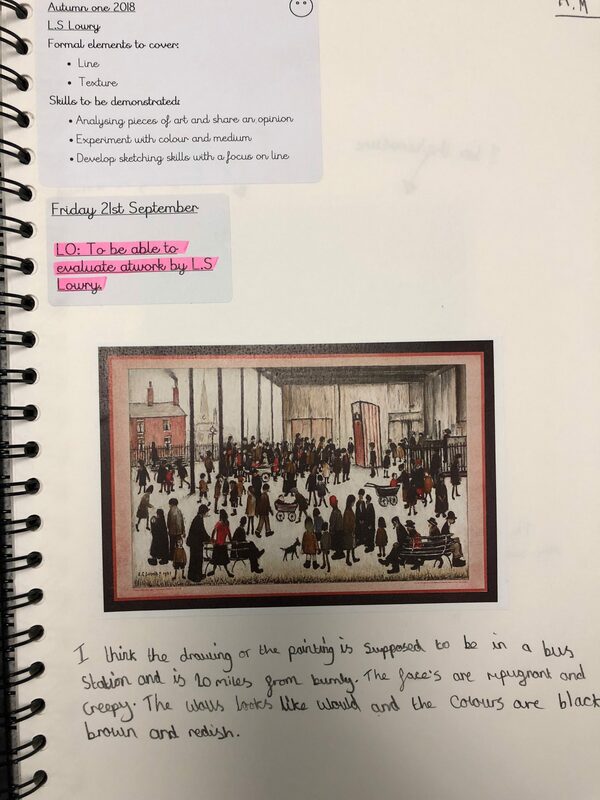 We are continuing with this next half term and the children will create their own piece in the style of Lowry. In line with a school memorial that is being created for Remembrance Day, the children worked with their learning buddies (see below for more information) to create poppies like the sculptures made to mark the centenary. We discussed materials, design and then created the poppies. Next half term we will be taking on a challenge, like those on The Young Apprentice, to create the perfect product for the Christmas Fair. 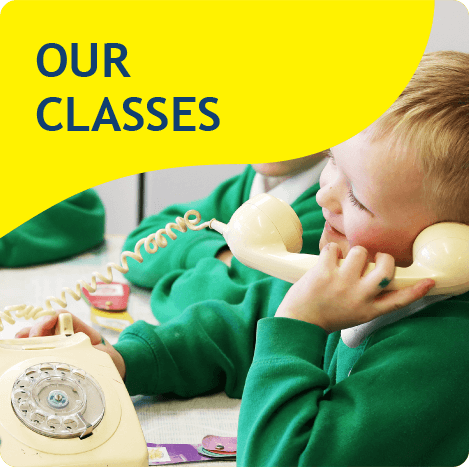 This half term, with our sessions with Mrs Staples, we have focussed on how to be healthy. 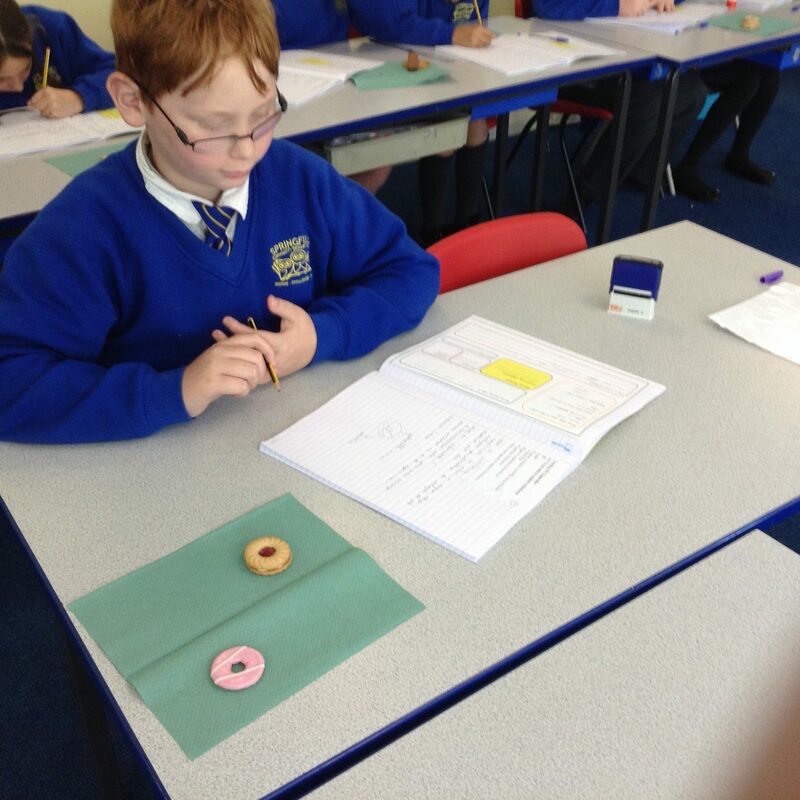 As well as practical sessions, we have also learnt about a healthy balanced diet, vitamins and minerals, cholesterol and the dangers of being unhealthy. Following this, we have developed an exercise regime and meal plan for Homer Simpson in a bid to improve his health. Next half term, we will be developing our netball skills and teaming up for full games. Year 6 can be a tough and stressful year for children, with SATs and transitions, it has its ups and downs. 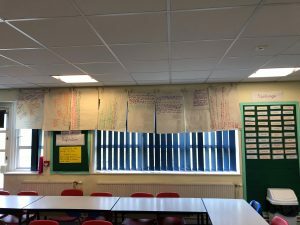 We have talked about our goals and worries for this year. 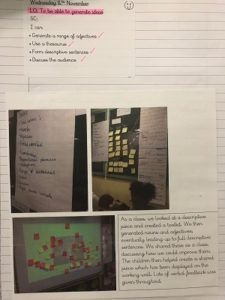 We realised that we are all feeling the same and the best tool to help us is to talk and to work together to improve how we are feeling. 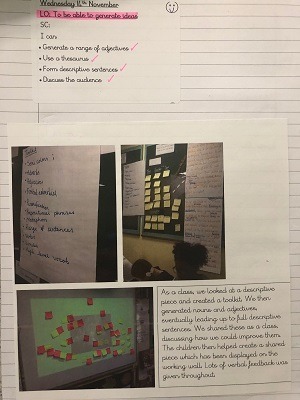 Following this, we have been thinking about our roles as ‘Global Citizens.’ We learnt about the life of children in Ghana who work on the cocoa plantations. 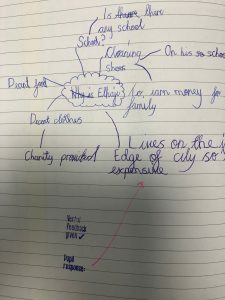 The children have begun to empathise with the children that have to work to look after their families as well as thinking about how we can help change the situation. 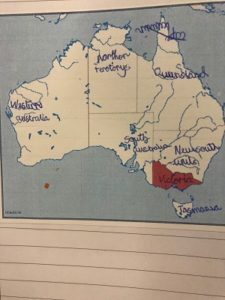 This year, year 2 and 6 have decided to team up. 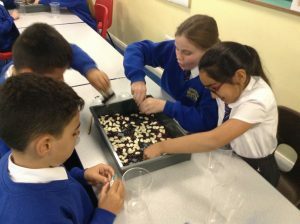 They have already worked together to create poppies and we are looking forward to working together to read and write and lots of other exciting activities.